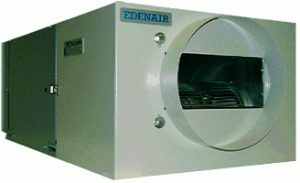 Vulcanic air dehumidifiers are designed to lower the humidity of an enclosure or premises (basement, workshop, warehouse, etc.). Vulcanic offers a full range of industrial dehumidifiers capable of processing volumes from 100 to 10,000 m3. These products can be self-contained and portable (mounted on castors), installed with air duct connection, hung from the ceiling or placed on consoles. Vulcanic air dehumidifiers use the principle of vapour condensation on a cold surface. This cold surface is produced by a hermetic cooling unit. It includes an air filter, automatic defrost, a regulation hydrostatic drive and an adjustable thermostat from 0 to 20°C. The refrigerants used in Vulcanic products meet the latest environmental standards. The air dehumidifiers can be equipped with a condensate gravity drain or with a condensate pump. Several options are available depending on customer requirements and application (embedded electric heating, control box with on/off switch and fan only, etc). 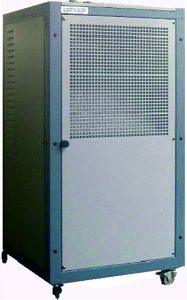 Vulcanic air dehumidifiers are designed and manufactured either as part of the standard range or as a customised solution in our factory in Neuilly sur Marne.